With SpongeBob in tow, Mermaid Man flashes back to a previously forgotten era of his heroic history--his adventures as Monster Master of Terror Trench! But what's the improbable secret of Mermaid Man's former monster sidekick? Find out as MM and SpongeBob “Return to Terror Trench!” Also: In part 4 of “Lost Booty” the quest of two humble pirates for the greatest SpongeBob comic ever continues…in the belly of a whale! 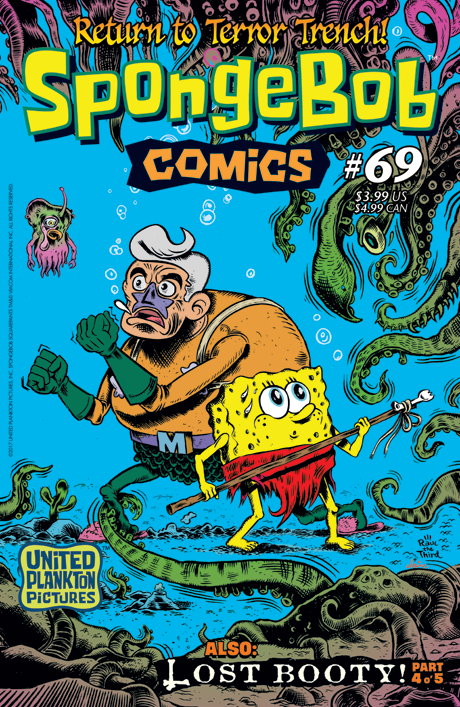 Plus: “SpongeFunnies” by James Kochalka and ocean fact comics by Maris Wicks!